In simple terms, profit can be understood as all the income that is received by an individual. It is the lifeline of the business, as, without profit, the survival is difficult, rather impossible. In accounting, profit means surplus, i.e. the excess of total revenue over the expenses. Such a profit is known as accounting profit. On the other hand, in economics, you might have heard the term economic profit, which is nothing but the amount left over after deducting all implicit and explicit costs. When we talk about business, there is the least amount of profit required for its survival, which is known as normal profit. In short different disciplines defines profit differently, which one must know while working on profits. In this article excerpt, we have discussed some fundamental differences between accounting, economic and normal profit. Meaning Accounting Profit is the net income of the company earned during a particular accounting year. Economic Profit is the remaining surplus left after deducting total costs from total revenue. Normal Profit is the least amount of profit needed for its survival. Advantage Reflects the Profitability of the company. Shows how well the company is allocating its resources. Helpful in knowing the future prospects of the company. The actual profit earned by the company during a particular financial year is known as Accounting Profit. The profit is obtained by deducting the total explicit cost from total revenue. Here explicit cost means the directly ascertainable cost spent on account of running a business, i.e. rent on land and building, the wages of labor, salary for employees, interest on capital invested, etc. The Accounting Profit is also known as net income or the bottom line. It appears in the last line of the income statement, and it is reported at the end of the financial year. This profit is the residual income left for distribution to shareholders of the company. Economic Profit also referred as extra profit or supernormal profit. It is the difference between total revenue earned by the company and the total costs (explicit as well as implicit). Explicit costs as explained above is the operating costs incurred while conducting the business activities. Implicit cost is the opportunity cost, i.e. the option forgone by the firm while investing the money somewhere else or using some other option. Implicit cost is also known as implied or imputed cost. The economic profit is used by the economists to measure the financial position of the company. Along with that, it helps in forecasting the future performance. It works as a yardstick in judging the efficiency and effectiveness of the company’s profitability. Normal Profit is the minimum amount of profit required by the entity for its perpetual succession. When the economic profit equals zero (break even point) as a result of the difference between total revenue and total cost, normal profit arises. If the amount is greater (positive value) than zero, then economic profit arises. On the contrary, if the amount is lesser (negative value) than zero, then this is a state of economic loss. Normal Profit equals to the implicit cost (opportunity cost) of the company. When the firm earns a normal profit, it means that it is earning enough earnings (i.e. Having sufficient money to pay off expenses) to keep the business going. It is just a measure used to judge the longevity of the company. The real profit earned by a company during a particular period is Accounting Profit; Economic Profit means the company is earning the abnormal profit, i.e. profit in excess of what is needed to cover the expenses. Normal Profit arises when Total Revenue (TR) = Total Cost (TC). The major difference between the accounting, economic and normal profit is that Accounting Profit is usually higher than economic and normal profit. 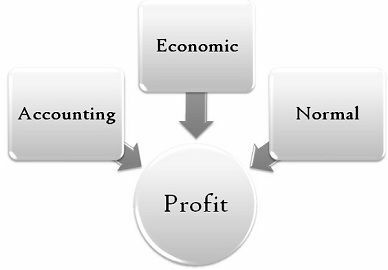 Accounting Profit is used to know the company’s profitability; Economic Profit is used to understand the company’s financial position. Normal Profit indicates that the company capable of meeting out its expenses. The whole future of the company depends on its profit earning capacity. If the company earns good profits, then it will give good returns to its stakeholder’s. So, the profits mentioned above are three completely different forms of profit. The analysis of the three will help in knowing about the company’s performance, profitability, future, financial stability and position as well. This would suggest, the stakeholders, whether to invest in the company or not.